The Toronto Marlies secured their 20th win of the season with a 4-3 win on the road against the best team in the AHL on Saturday. With the extra-time victory, the Marlies are now 11-5-3 on the road this season. It wasn’t pretty at the back-end of the game, but Sheldon Keefe could not have asked for a better first-period effort from his team. All four lines were rolling as the Marlies had the Checkers reeling with high-tempo play and tenacity in every puck battle. The fourth line nearly got Toronto on the board, but both Gabriel Gagne and Colin Greening were denied following an excellent zone entry by Dmytro Timashov. Michal Hutchinson was merely an onlooker until the sixth minute of the game, when the Checkers recorded their first shot of the night — a great chance for Clark Bishop, who was stonewalled by the Marlies goaltender. Callum Booth made a good save at the other end on Toronto’s first power play and also robbed Pierre Engvall on a breakaway with 8:30 on the clock. Engvall refused to go away, though, cashing in a minute later when he tipped home a shot from Jordan Subban to open the scoring. The Checkers’ first attempt with the man advantage was thwarted by a committed effort by Toronto’s PKers and in particular Mason Marchment, who bravely dove to block a slap shot. The Marlies then doubled their advantage on their second power play after Jeremy Bracco’s intended slap pass to Chris Mueller turned into a shot and the puck found its way into the net off of the inside of Booth’s pad. Charlotte thought they halved the deficit at one point, but Janne Kuokkanen’s goal was rightly waived off for a high stick. The Checkers also received a couple more power-play opportunities before the end of the period, including 12 seconds of a 5-on-3 to close out the opening frame. The Marlies PK was again excellent, and a flying glove save from Hutchinson ensured his team held onto their two-goal heading into the intermission. The Marlies killed off the remainder of the second penalty to begin the middle frame before Josh Jooris hit the iron with a snapshot that had Booth beaten two minutes into the period. The first bit of bad news for the Marlies then arrived after Jordan Subban fired a shot straight at Nick Schilkey, allowing the right winger to streak in alone on net and beat Hutchinson glove side. It was almost immediately a tie game right after, but Trevor Carrick rang a long-range effort off the post, with the Checkers now in the ascendancy. It took the Marlies until around the ten-minute mark to regain their composure and begin to assert themselves on the game again. Calle Rosen picked up a loose puck at his own blue line, and with space in front of him, dashed to the top of the left circle. Booth stopped his initial effort, but the Swedish defenseman picked up his own rebound and gave Toronto a 3-1 lead with 40 minutes in the book. 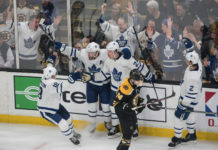 The officials put their whistles away for most of the middle frame, but all that changed late on in the middle 20 and into the third period, when Toronto found themselves down by two men for 82 seconds. Hutchinson had no answer for a shot from Jake Bean through a screen in front to bring Charlotte within one. A tying goal wasn’t long in arriving — Vincent LoVerde was stripped of the puck in the neutral zone and Checkers captain Patrick Brown took advantage by finishing low past Hutchinson. With momentum now fully in Charlotte’s favour, they looked odds-on to win it in regulation in the final 13 minutes, but to their credit, the Marlies hung tough, even when forced to kill another penalty. Perhaps a little fortunate to have one point in the bag, the Marlies were a little tentative in the early going of overtime, almost allowing Schilkey to clinch the victory with his second of the game. That save from Hutchinson, albeit not registered on the stats sheet, resulted in a rush by Trevor Moore, who drew a good save out of Booth. With Calle Rosen down and out in the checkers zone, Charlotte broke away with Timashov the last man back. The diminutive winger did an excellent job of holding up the Checkers rush, and when the pass went to the trailing man, Marchment launched out his long stick to poke the puck clear and create his own breakaway the other way. Having only scored once in his last 11 games, there was no sign of a lack of confidence in Marchment’s finish as he deked around the goalie’s poke-check and slid it home to clinch the extra point. – It ultimately didn’t cost the Marlies, but the bewildering officiating led to Charlotte’s seven attempts on the man advantage to Toronto’s three. It was really only two power plays for Toronto, with the third lasting nine seconds. – The winning strike was Mason Marchment’s 11th goal of the season and he now leads the league with three overtime tallies. – A goal and an assist for Jeremy Bracco puts him at a point-per-game pace through 39 outings. He’s tied for the league lead in assists with 30. – Calle Rosen continues to shine offensively with another two-point game (1-1-2). It’s his fourth multi-point haul in 12 games. His 28 points rank him eighth among all AHL defensemen. – A lone assist for Chris Mueller takes him to the 40-point mark (19-21-40) and he continues to lead the Marlies in scoring. – Andreas Borgman returned to action for the first time since suffering a concussion. In his first outing in almost four weeks, he helped give Toronto some stability to their defensive core on the second pair with Frank Corrado. – Gabriel Gagne made a promising debut and could easily have scored in the opening frame. He featured on the second power play unit but found his minutes limited from the second period onwards due to the number of penalties handed out. – With the Marlies outshot 34-25, Michael Hutchinson was excellent in his second start as a Marlie. “We got very lucky to get two points today and it was because of our start that we get the two points, and obviously the performance from Hutchy in goal,” said Keefe.